The Nut-Free Mom Blog: Trick or Treating with Food Allergies?? I ran the following post last year and with the questions and comments I've been getting lately, I think it's worth a repeat. Halloween can be a scary time of year for kids with food allergies but you can make it a lot less scary by shifting attitudes and making some changes to the routine. Kids love Halloween--all kids. So let's find ways for them to have fun and participate! Halloween is on everyone's mind these days and if your child has severe food allergies, the prospect of candy is definitely scarier than any other aspect of this holiday. When my daughter was first diagnosed with life-threatening peanut and tree nut allergies, we considered not doing the whole trick-or-treating thing. It just seemed counterproductive and potentially harmful emotionally. Why be handed lots of candy that you can't eat? We thought about doing other Halloween activities, like attending Halloween-themed events at the zoo and Chicago museums, but seriously thought about just skipping the candy routine. My daughter was 5 years old at the time and all she cared about was dressing up like a Disney Princess (that year, I think it was Sleeping Beauty.) She really wanted to go door to door in her fancy costume and I didn't want to have her miss out. Thinking back to my own childhood, Halloween was never only about the candy. It was mostly about dressing up and hanging out with my friends after dark. Candy was a nice side benefit--but definitely not the whole point. Why should it be any different for my daughter? We decided to take her out and just remove the obvious unsafe candies--Snickers, Reeses, Butterfingers, M&Ms, and sort through the rest of it later. It was amusing to see the reactions of neighbors who tried to hand my daughter a Snickers bar. She would politely refuse, ask if they had anything else and then say "OK, then. Thank you anyway" and skip back down the street. Most were like "huh?" A few thought she was being ungrateful or picky. So what? She was so empowered. Finally, I said "just take the candy and I'll put it in a separate bag." That's what she did and all was well. When we got home, I traded her unsafe candy for a Halloween treats bag: Bonne Belle lip balm, stickers, safe candy and a Halloween book. She loved it! By the next year, she was running back to me to hand me Snickers bars and the running to the next house without a second thought. Let me tell you, people love their Snickers. I had a bag full of them by the end of the night. No matter. Being with her buddies and dressing up was enough for my daughter--plus she knew she got her own special goody bag later. I totally agree! My daughter is almost 14 now and she is very confident in her ability to handle herself and her food allergies. (So much so, that she went on her own to Europe this summer with a student group.) She is able to say "No" when necessary and able to manage her eating habits safely. I believe that kids with food allergies need to attain the ability to manage temptation and, perhaps, disappointment as well as how to interact with people they don't know well (and who may know very little about food allergies). This should be integrated into their normal growth experience as early as possible. Our kids can gain so much from trick-or-treating! With parents trailing behind in the background, it's a supervised activity that allows for some independence and gives our kids the opportunity to learn many important life skills. Most importantly, they can do all this while having fun with their friends! I have 3 children, 2 of which are allergic to peanuts and tree nuts. I never worry about the unsafe candy they get because when they're done trick or treating , they trade with their brother the items they can't eat. It's a win win for all. Mine are still young, so this could change as they get older, but our current way of handling trick-or-treating is to dress up early, go out early, get some candy in the bags, bring it home and dump in it the candy bowl to hand out. Then we go out again to collect more. At the end of the night, I've handed out most of what we've collected, and the safe stuff that I've purchased (whatever is still left) is what my kids end up with. thought I'd share our Halloween tradition that our daughter then 5 came up with her self. We go trick or treating as normal (beacause she loves the dressing up part)we do this for about 30 minutes. Then, we return home and she hands out the candy she just collected ! My son is 8 now and has a peanut allergy also, we do participate in Trick or Treating. He will either say no thank you if it is something he can't have or just politely say thank you and he knows when we get home that we will sort out the "good" from the "bad". I use to buy a whole lot of safe candy for him so he could trade out what he couldn't have with the safe stuff. Now my husband and I buy his candy that he can't have!! Maybe a penny, nickel or dime a piece!! He looks so forward to Trick or Treating, that the candy he can't have doesn't even matter!! He just has fun and fills his piggy bank!! Right on!...We've been trading candy out for our 8 year old for years now; we gave him non-food treats for years too. He loves the experience of running house to house with his friends, and we just try not to make a big deal about the massive amount of peanut candy and just try to focus on the candy and fun he can have! My son is nearly seven, and couldn't care less about the candy aspect of Halloween. I typically swap out the nut-candy at home and it goes to the office next day. asked what he wanted for "swaps" this year he replied, "A chemistry set, and some pencils with good quality leads." I stopped laughing when I understood he meant it. The costume making, doorbell ringing, etc. are the best parts of Halloween anyway. "I'm allergic to peanuts, do you have anything else?" that's exactly what my son said and the neighbors said, "wow, you're picky!" I said the exact same thing you said! The "Great Pumpkin" visits our house after trick or treating. 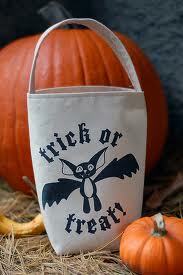 In exchange for their candy bags, they get a festive bag containing their favorite "safe" treats and some small toys. My kids eagerly await this exchange and gladly do it. They end up with things they prefer, staying safe in the process... and as an added bonus, I get to limit their candy intake! Win-win for everyone!